The standard treatment for Ta-T1 high-grade (G3) TCC of the bladder and CIS is TUR followed by BCG full dose once a week for 6 weeks and then at month 3, 6, 12, 18, 24, 30, 36 according to the SWOG schedule. The efficacy of adjuvant immunotherapy in the elderly has been discussed and questioned. A reduced activity of BCG has been reported due to the impairment of the immune-system response than in patients more than 75 years of age. When a patient with CIS presents with a recurrence during BCG therapy it can be called BCG failure. The therapy of patients with CIS who experienced a BCG failure is radical cystectomy, according to international guidelines. However, in elderly patients with co-morbidities unfit or refusing surgery a conservative treatment can be adopted. Chemotherapy with MMC and hyperthermia (Synergo) once a week for 6 weeks should be the first choice. A second option for these patients with recurrent CIS is the administration of Gemcitabine high dose (2,000 mg a week) for 6 weeks. Finally, INF-alfa with BCG has shown efficacy in these patients. Babjuk M, Oosterlinck W, Sylvester R et al. 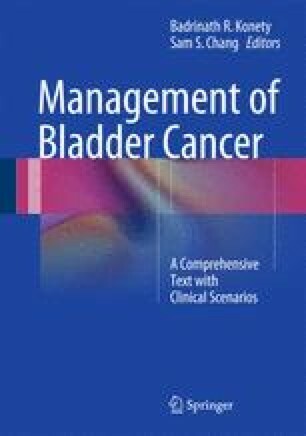 European Association of Urology guidelines on TaT1 non muscle invasive bladder cancer. Update march 2009. Arnhem, The Netherlands: European Association of Urology; 2009. Available from http://www.uroweb.org/professional-resources/guidelines/online.